The melting of bulky and thin-walled returns is a challenge frequently facing aluminium foundries as a result of the growing trend towards lightweight construction in the automotive sector. For this reason, the expert StrikoWestofen (Gummersbach) has now developed the “StrikoMelter BigStruc”. This melting system is designed to function extremely energy-efficiently, even with exceedingly thin-walled returns. Thanks to its special shaft design, the BigStruc can even handle returns with an area of up to 2.5 m2 without any problems whatsoever. Other new developments in the BigStruc guarantee very low metal loss for charge material of all geometries as well as high heat recovery rates, even at a low bulk density in the shaft. 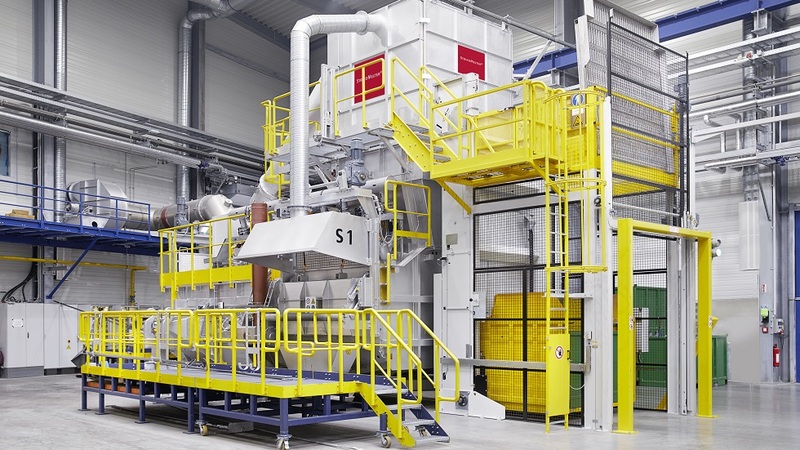 More and more structural parts are now being manufactured using the die-casting process, and this is changing the demands made on aluminium foundries: on the one hand, it leads to considerably larger, flatter returns. On the other hand, however, companies are increasingly faced with small-sized, extremely thin-walled returns. The new “StrikoMelter BigStruc” from StrikoWestofen (Gummersbach) is designed to meet precisely these high demands. The wider range of geometries which have to be remelted in the foundry as a result of the casting of structural parts has led to new, complicated furnace solutions being offered in the market. These often push up the investment costs still further and, in addition to natural gas, consume considerable amounts of expensive electric energy – for example for the electromagnetic agitation of the holding bath and for the hot gas fans designed to melt the material in huge holding baths. StrikoWestofen has added the BigStruc model to the globally tried-and-tested StrikoMelter series of furnaces by means of a number of simple new developments. BigStruc allows the optimum melting of bulky cast parts as well as extremely thin-walled or small-sized returns. Although the return material is very demanding, BigStruc guarantees minimum metal loss and the well-known low energy consumption of the StrikoMelter series. While still in the shaft, the cast parts are preheated without direct exposure to the flames and rapidly melted at the foot of the shaft. The hot metal then flows directly from the melting bridge into the holding bath, where it is heated to the desired temperature. As a result of the continuous melting process, temperature fluctuations do not occur in the holding bath. Liquid metal for supplying the foundry is also available at all times. “The special feature of our BigStruc is its high energy efficiency, even at a low bulk density in the shaft,” explains qualified engineer Rudolf Hillen, product developer and StrikoMelter expert at StrikoWestofen. “In contrast to normal StrikoMelter systems, BigStruc is able to handle returns with a size of up to 2.5 square meters.” Here the height of the shaft remains unchanged in comparison with standard StrikoMelter systems. To be able to guarantee high energy efficiency even at a low bulk density and void volume in the shaft, StrikoWestofen is now using its new hot gas baffle for normal melting operation too. This has often proven its practical worth in StrikoMelter systems as it speeds up the melting-free process before the furnace is cleaned. The baffle keeps the shaft of BigStruc closed after filling and ensures that the heat is used in an optimum way for preheating – regardless of the void volume in the shaft. The preheating and melting of the charge material take place while the shaft is closed. To ensure that the shaft is filled optimally at all times, StrikoWestofen has integrated a new three-dimensional laser monitoring system. This constantly checks the filling level in the shaft when closed and during filling in order to guarantee that the hot gas baffle closes automatically. To keep the metal loss as low as possible, StrikoWestofen uses further new developments designed to minimize the free oxygen present in the furnace atmosphere: near-stoichiometric combustion and self-sealing lift swing doors. Combustion with minimum excess air prevents corundum formation and ensures low oxidization losses and a high material yield. Of course, BigStruc can also process all material and returns already occurring in the foundries of today. This makes BigStruc the most versatile system in the StrikoMelter series. More details or quotes for the “StrikoMelter BigStruc” are available directly from our sales team via e-mail (sales@strikowestofen.com) or by telephone (+49(0) 2261-70910).